While this article focuses on golfers, it is also applicable for skiers, bikers, hikers, sun bathers and children of any age. As a senior golfer, I make it a practice to visit my dermatologist, Dr. Will Strickland in Colorado Springs, twice a year at the beginning and end of the traditional golf season. These visits are for full body inspection to detect any problems that may be developing. Sun damage is a cumulative situation. I had no idea how much so until recently. In the past two years moderate to serious sun damage lesions have been found on my person which required surgery. The serious lesion, melanoma cancer, required Mohs surgery, which was performed by Dr. Brett Matheson. Most pre-cancer lesions can be treated with medication (prescribed Efudex, 5% Fluorouracil cream), liquid nitrogen (freezing), or excursion. Following my Mohs surgery, Dr. Matheson was very considerate to spend time with me discussing skin cancer and I asked him a ton of questions. Many of those questions and answers from my conversations with both doctors are listed below. I guarantee you will find some to be very valuable and may even lead to your healthy longevity on the links. All answers below are my understanding of questions asked during conversation with both doctors. There were 139,000 new cases of Melanoma in 2014. There are more than 3.5 million non-melanoma skin cancers each year in the U.S. The majority of these are caught early and people do fine. But it is estimated that there will be 9,700 deaths due to Melanoma this year. One American dies of Melanoma every hour. 1. Is it too late for seniors to be concerned with skin cancer? It is absolutely not too late. Even if someone has had skin cancers in the past, the risk can be decreased by protective measures. 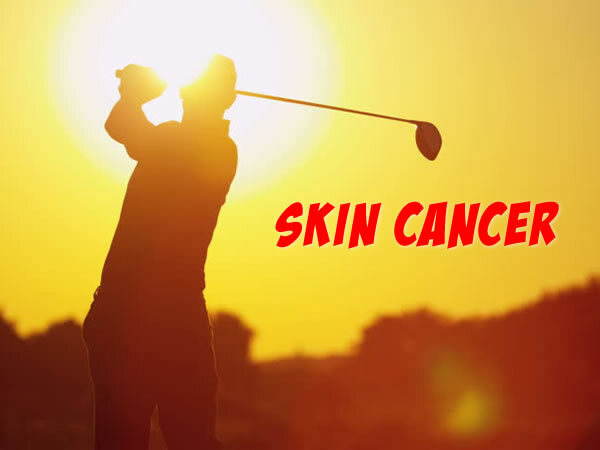 Many skin cancers develop later in life as the result of cumulative exposure to the sun. Even if someone has had extensive sun exposure in the past, they can reduce the cumulative damage by beginning to protect their skin at ANY AGE. 2. If not too late, what protective measures should be taken? Common sense precautions include wearing a brimmed hat, wearing sun glasses, and applying sunscreen to all exposed areas. Also avoiding the sun during its most intense hours--10am - 4pm when possible can reduce risk. Golfers would be wise to get early morning Tee times (or late afternoon/evening Tee times). There is also a variety of tight-knit chemically treated clothing that can help protect the skin from the damaging ultraviolet rays of the sun. 3. At what age should sun screens be started? Sun protection should be a lifelong goal. Sunscreen on babies should be a physical sun block, such as zinc oxide or titanium dioxide so as to not sensitize the baby. This should be discussed with your pediatrician if applicable. 4. What is the difference between sun blocks and sun screens? The term sun screen and sun block can be used interchangeably, but some use the term screen to refer to chemical products that block the sun rays, whereas sun "blocks" are physical agents such as zinc oxide or titanium dioxide. Both are effective. 5. What is the minimum and maximum SPF (sun protective factor) that is effective? An SPF of at least 15 should be used for best protection. An SPF higher than 15 (such as 30 or 50) is more effective, but not by much. There are many golf bag clip-on sunscreens for golfers rated SPF 30 and 50. 6. What is your opinion on water resistant and sweat resistant sun screens? They don't exist. In fact the FDA is considering banning this type of claim on sunscreens. 7. How often should sunscreen be applied? Every nine holes! Many manufacturers recommend that swimmers, and after heavy sweating activity, reapply within 80 minutes. 8. What role dose Efudex (Rx) have and is it effective? Efudex or flourouracil (generic name) is "chemotherapy in a tube." It lights up pre-cancerous areas and burns them off. It can smooth the skin and treat the scaly, crusty areas that are often the result of cumulative sun damage. Efudex can only be accessed by physician prescription and directions should be followed closely. 9. What hours of the day is one most exposed to UVA. 10. Is seasonal exposure of concern? The sun can do damage year round but is probably less when the sun is lower on the horizon during the winter in locations like Florida, Mexico, Africa, South America, etc. 11. Does it have to be sunny out to get exposure to UVA and UVB damage? No. Burning rays can penetrate through clouds. 12. Does the time of day vary from geographical location to location? Yes. Florida, Mexico, Africa, South America, etc. less exposure, high altitudes like Colorado more. 13. How is the need for Mohs surgery diagnosed? A biopsy is the method used to determine if Mohs surgery is required. Learn more about Mohs surgery on line. www.SkinCancerAndDerm.com. 14. When is Mohs surgery indicated? Mohs is usually performed for skin cancers that are large, have aggressive growth patterns, are recurrent (have been treated once before and treatment failed) or are located on areas where tissue conservation is important--such as the eyelids, lips, ears, and nose. 15. What are the possible after effects of Mohs surgery? Pruritus (itching), scarring, numbness, possible additional surgery. 16. What is liquid nitrogen's role in treating skin cancer? Liquid nitrogen is used to treat precancerous spots on the skin--"actinic keratosis." This technique freezes the lesion which scabs over and falls off within a week or two. 17. What parts of the body are most vulnerable to skin cancer? Any part of the body can get skin cancer. Melanoma can occur anywhere. The more common skin cancers--basal cell and squamous cell carcinomas usually (but not always) occur on sun exposed areas. 18. What are the odds of losing one's face to skin cancer? Not likely if you go to a dermatologist early! 19. Is skin cancer on lower legs from wearing shorts a major problem? 20. What role does temperature; snow and cloud cover play in exposure? Temperature doesn't matter so much---skiers get skin cancer from wintertime sun. Cloud cover partially but not completely blocks the sun's rays. 21. Does temperature have anything to do with UVA/UVB exposure? Not really, other than the fact that in the summer time the sun is more directly overhead, the temperature is hotter, and that's the most dangerous time. 22. Do clothing (golf polo shirts) claims of protection have significant credibility? Yes. Some manufacturers will use an especially tight weave, and treat with sun-blocking chemicals. They will usually advertise this. 23. Does a dark tan help prevent sun damage? While a base tan may help prevent sunburns, tanning still contributes to the development of skin cancer and premature aging of the skin. Also, it gives one a false sense of security, thinking that more time can be spent in the sun due to the presences of a base tan. 24. Does sun tan lotion have any benefit to protecting from sun damage? Not unless the lotion contains sun screen or sun block chemicals. To my knowledge there are not any. UVB rays contribute to all types of skin cancer and are strongest during mid-day. UVA rays contribute to premature aging of the skin and to the development of melanoma; UVA rays remain strong as long as the sun is shining, regardless of the time of day or how low the sun is on the horizon. 25. What's the balance between using the sun for vitamin D absorption and skin cancer exposure? DO NOT rely on the sun for your vitamin D needs; take a supplement such as vitamin D3, 2000 International Unity daily with food. Vitamin D3 2000 is an over the counter supplement that does not require a prescription. 26. What is the best sequence for application of sunscreen, mosquito lotion, and moisturizer? Apply sunscreen or sunblock first and wait 30 minutes before applying a moisturizer and after it dries, apply mosquito lotion or bug spray. John Darling is the published author of THE COMPREHENSIVE GUIDE TO A SUCESSFUL FUND RAISING GOLF TOURNAMENT available on line from Amazon.com and BarnesandNoble.com as well as other booksellers found on the internet.